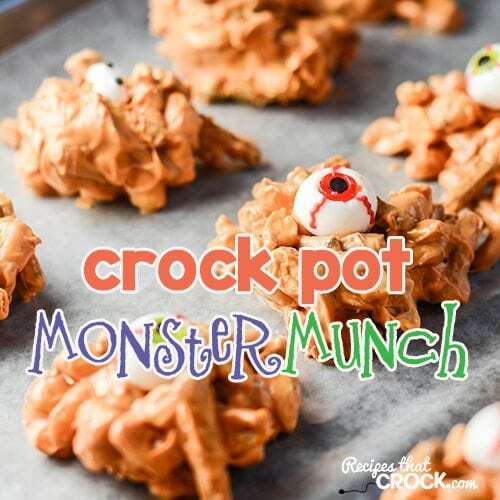 Crock Pot Monster Munch - Recipes That Crock! Are you looking for a great treat to make with your kiddos for Halloween? Then you don’t want to miss this Crock Pot Monster Munch! Miss Add and I had a blast making this together…and best of all, you can change it up to include your favorite candy morsels! When Miss Add and I were trying to think up a fun treat idea Crock Pot Monster Munch was born! We love crock pot candy in this house. 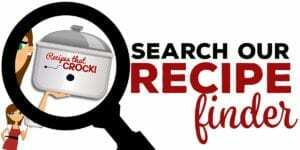 Aunt Lou and I discovered how awesome the crock pot was for making candy a little bit back when I made Peanut Cluster Crock Pot Candy, and she made Slow Cooker Bunch of Crunch Candy. There has been no turning back since! 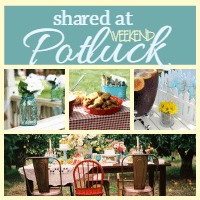 We love using our crock pots for candy! No constant stirring. Just throw it in and let the crock do its thing… then stir a couple times and your candy is ready! 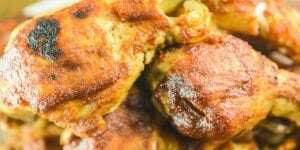 Once we created these spooky little monsters, I knew I wanted to have it as the next recipe featured in our Faces Behind Our Food Series (sponsored by Indiana’s Family of Farmers). This candy is just the recipe to introduce you to my friend Crystal and her farm family! 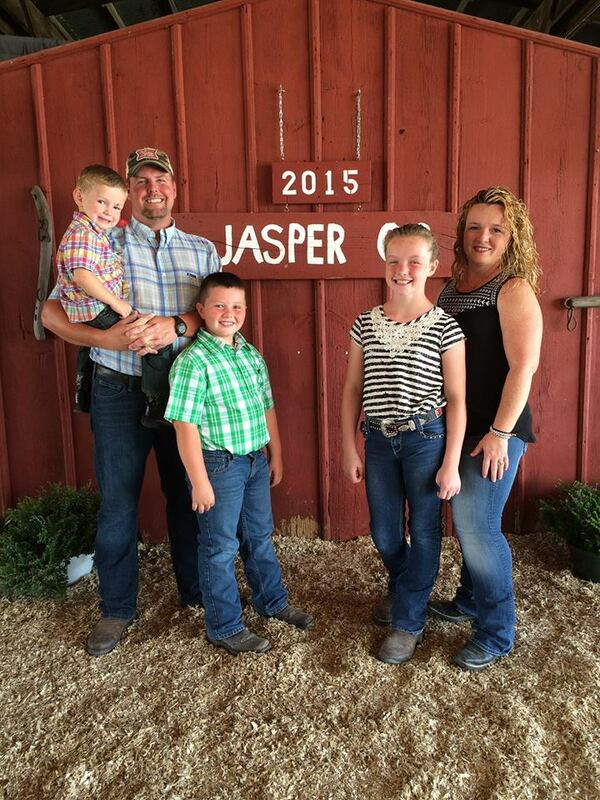 Dave and Crystal Kellner are 4th generation grain farmers, both work off the farm. 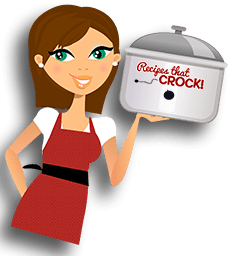 So what does a crock pot candy recipe have to do with Crystal’s family? Well besides raising corn, Crystal is also a grain buyer for Co-Alliance. As a grain buyer, Crystal buys grain to sell to processors to make all kind of things… Including something very useful in this recipe… WAX PAPER. 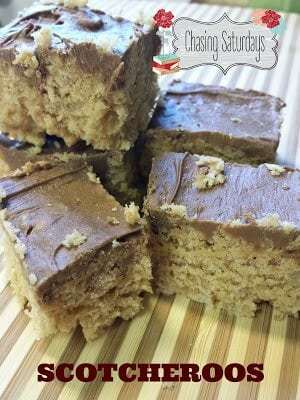 These Scotcheroos would be a huge hit in this house! 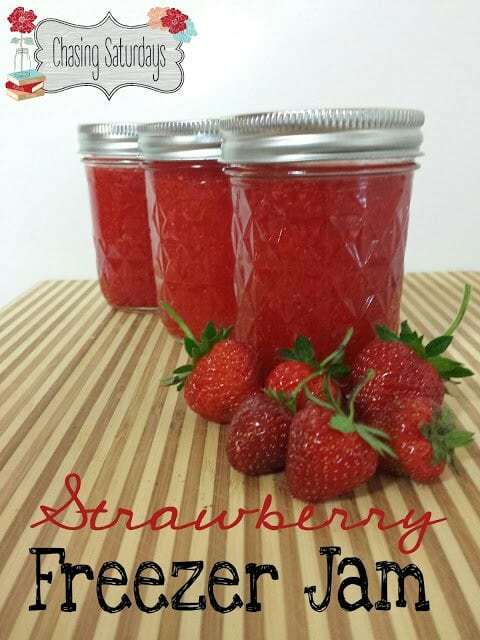 This Strawberry Freezer Jam recipe reminds me of the freezer jam I used to make with my mom. 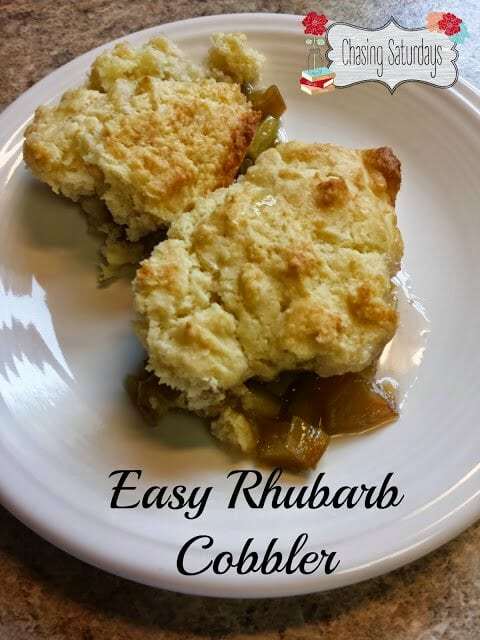 Crystal’s Easy Rhubarb Cobbler post not only has a great recipe, it has a funny story to give you a smile for the day! 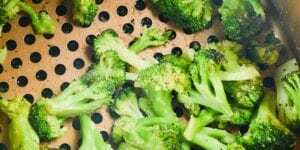 Now that you have met Miss Crystal and her family, on to this fun recipe! Miss Add and I whipped it up with pumpkin spice and butterscotch candy morsels, but you can use chocolate, mint chocolate, white chocolate, peanut butter whatever kind of morsel combination floats your boat! candy eye balls (gummy eyeballs colored candy eyeballs and/or candy eyeballs). Let stand until set up completely. I used a variety of eyeball candies from my grocery store but if you can’t find them, Amazon does have some options (gummy eyeballs, colored candy eyeballs and candy eyeballs). 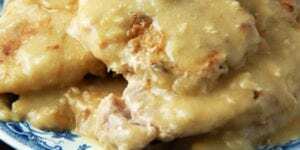 My slow cooker only took 30 minutes to heat my morsels to the perfect temperature. But I have had slow cookers take an hour or two. 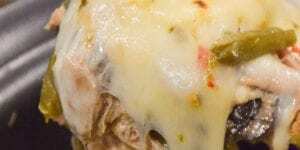 It is best to test this recipe out for the first time when you have time to watch it. It is highly recommended you stir this every 30 minutes to know how close you are to having everything melted. Looks can be deceiving. Make sure you mix things up really well every time you stir… a lot of times it is ready well before it looks like it should be. 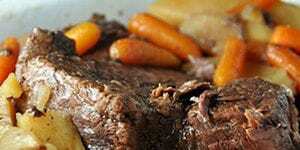 I used a 4 qt slow cooker but I have used a 6 qt in the past just fine. 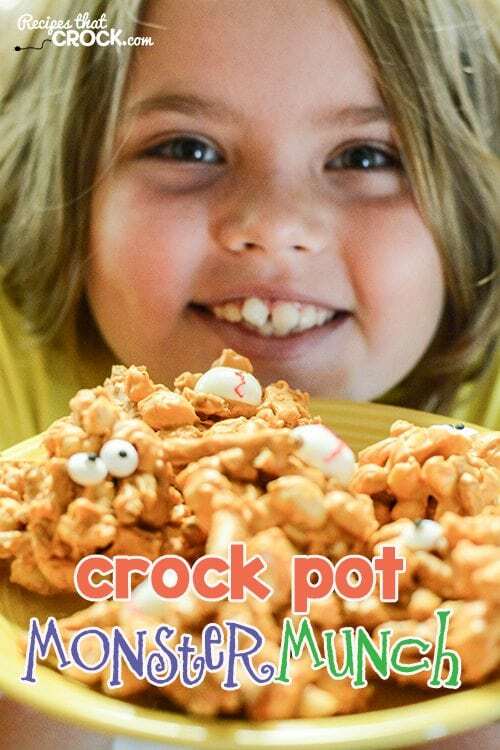 This Crock Pot Monster Munch is a fun treat to make with your kids! I used a variety of eyeball candies from my grocery store but if you can't find them, Amazon does have some options (gummy eyeballs, colored candy eyeballs and candy eyeballs). Looks can be deceiving. Make sure you mix things up really well every time you stir... a lot of times it is ready well before it looks like it should be. What kind of peanuts should I use? Roasted and salted or dry roasted? I used dry roasted peanuts. Enjoy! What size bags of candy morsels? Did you use white chocolate or butterscotch? They were 11 oz bags. I used Pumpkin Spice and Butterscotch for these. I am assuming the peanuts, or other nuts, are added when the pretzels and candy morsels are put in the crock pot. I am just verifying. Another option, instead of using pretzel pieces, chow mien noodles could be used too. Yes, it all goes in at the beginning except for the candy eyes. Enjoy! !